Today I am going to go further afield than I have before. 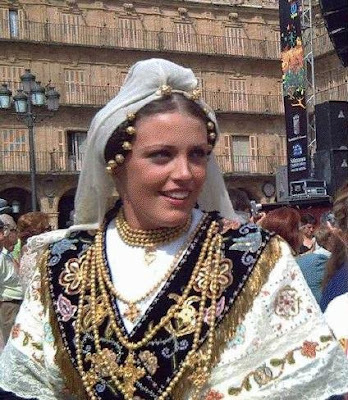 Spain has some incredibly beautiful and complex costumes, but there seems to be limited literature on the subject. [If anyone can acquaint me with more sources, i would be very glad of the information]. 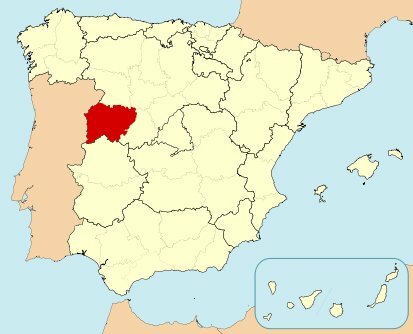 Salamanca is a city and surrounding province in the northwest of Spain, historically part of Leon. Here is a schematic map showing the location of the province. There are a handful of different costumes worn in this province. Here is a map localizing them. 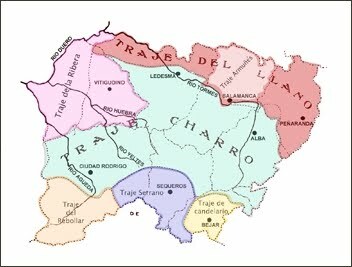 Today i will be talking about the costume in the center of the province, which is shown in light blue on the map above. 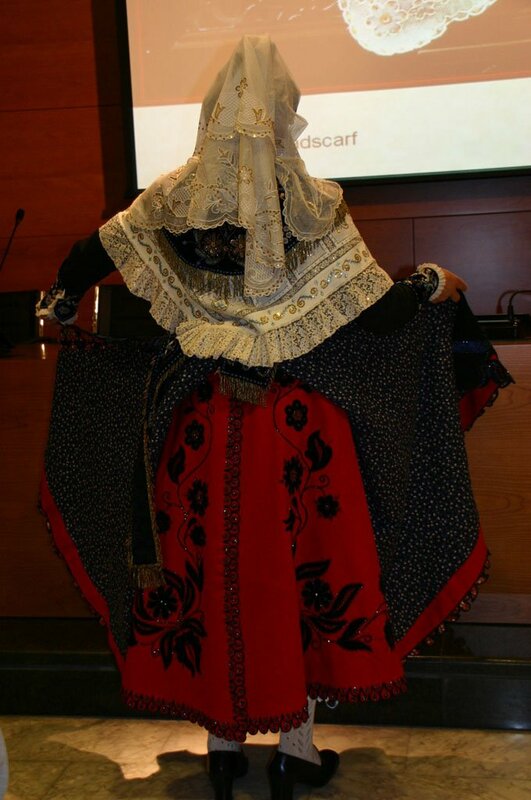 This costume, and the people who wear it, are called Charro. This is not to be confused with the Mexican costume called Charro, which is worn by Mariachi bands. The only thing they have in common is being highly decorated.I have leaned heavily on the internet for my research on this costume, i have to thank all those who are proud of this costume and have posted images of it online. There are a few variants of this costume, i will limit myself to just one of them in this posting. 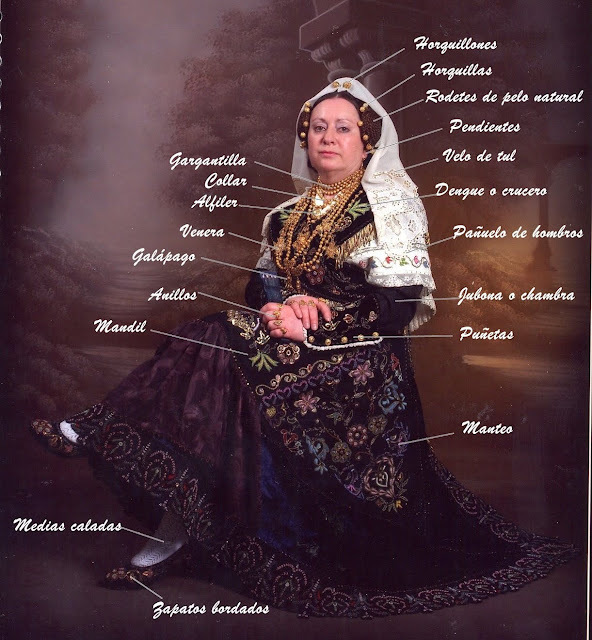 As you can see, the costume is rather complex. A foundation layer is established by a one chemise, camisa, the only part of which shows is a bit of linen and lace at the neckline. 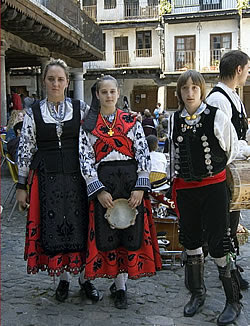 Textured knit stockings are worn, then there are bloomers, the bloomers were not part of the original peasant costume, but are now worn under the influence of city costume. Over the bloomers a full petticoat is worn. 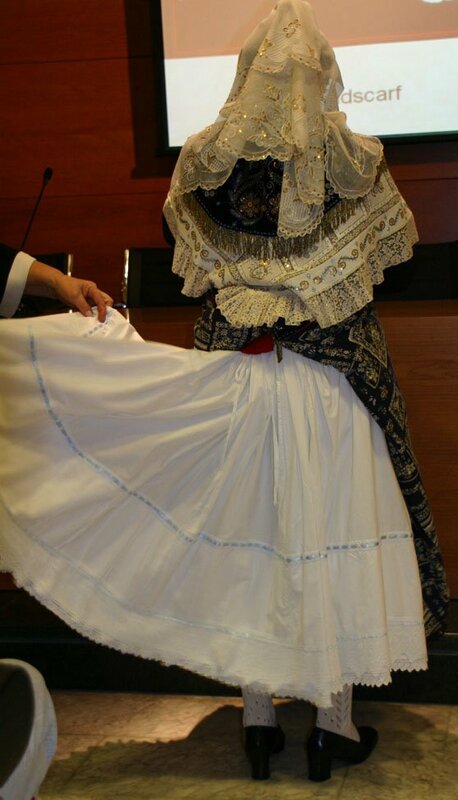 Over the petticoat an underskirt is worn, called the saya. This is generally made of red wool. If you look at the image above, it appears to be lined. 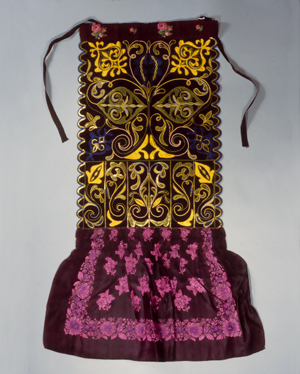 The saya is scalloped around the hem, and may be embroidered. On less formal occasions the saya is worn as the top skirt. The saya, from this image, seems to wrap around and overlap in back. 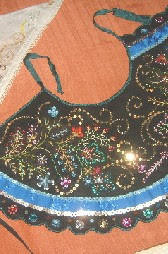 The main skirt has this cut as well. It is called Manteo, which literally means mantle. 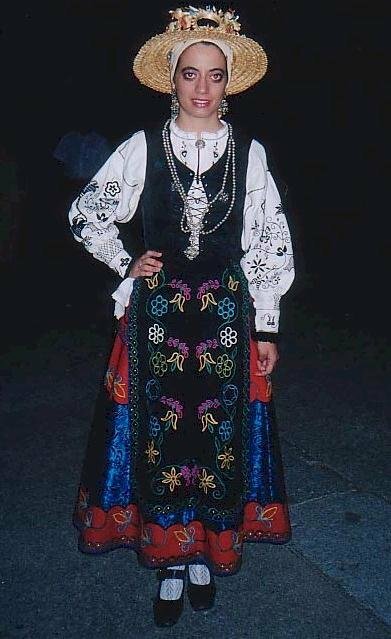 It is cut in a half circle, with a cut out for the waist, and is wrapped around from the front, overlaps in back, and has ties which fasten around the waist. 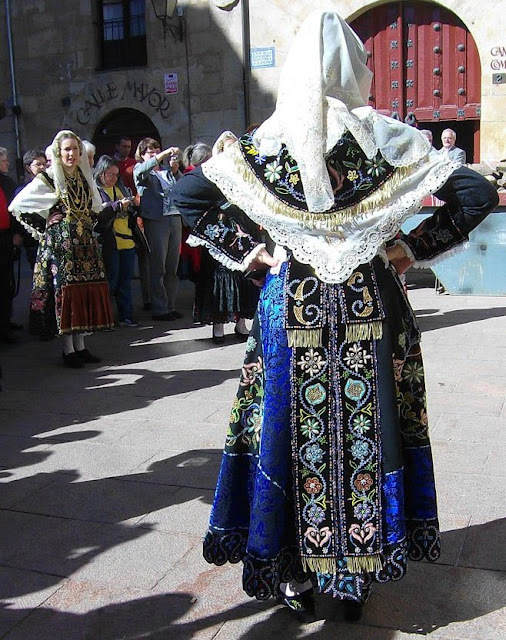 This type of skirt is typical of northwest Spain. Here is one from the neighboring district of Calendario. The ornamentation is different, but the cut is the same. There is a broad band of brocade or velvet around the hem and the left edge which overlaps on top, as you can see from the images at the top of this posting. 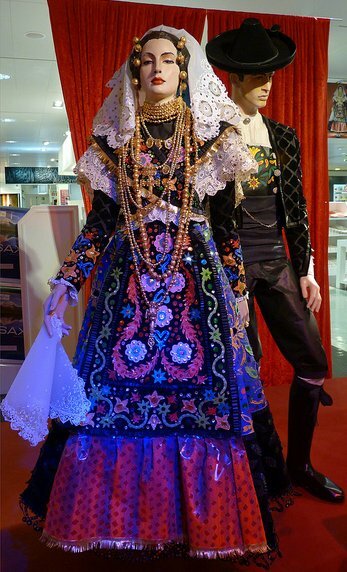 Here is a manteo which was made for a doll. 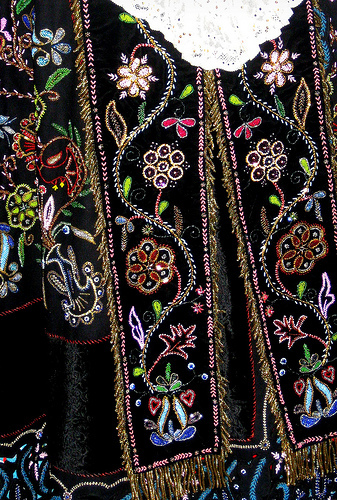 The two inner corners are embroidered with floral designs, generally from a stem which originates in each corner. This may be in black on black, for ceremonial costumes, gold and silver metal embroidery, beadwork, or colorful chain stitch. The middle, that is the front center, is left unornamented because it is covered by the apron. See the various images. The outer edge, or hem of the manteo often has a gingerbread type cutout design with embroidery. Over the back of the manteo is tied the cintas de manteo, a large bow with matching embroidery. The tails reach almost to the hem of the manteo, and the two short 'bow loops' generally have the initials of the maker/owner on them. These have their own ties which go around the waist. They usually have gold fringe around at least some of their edges. 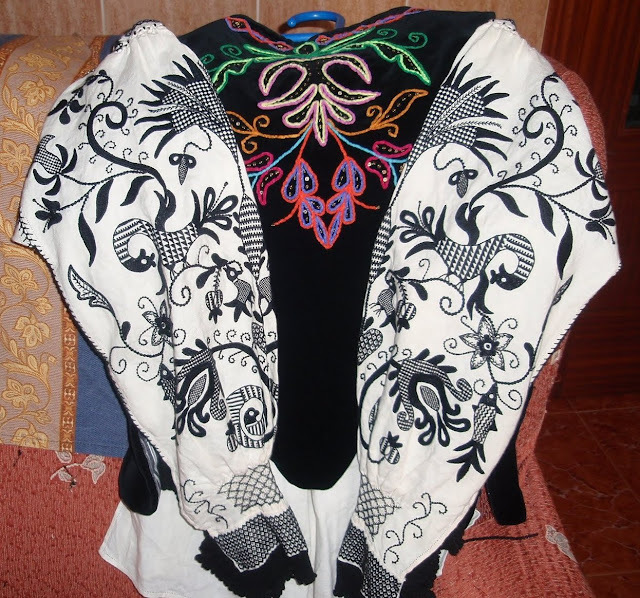 On the right side the faltriquera, a separate pocket is worn. 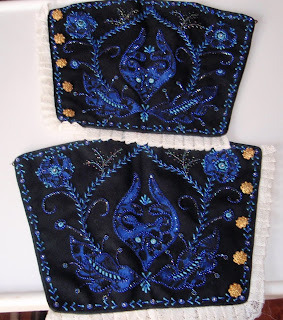 The left and bottom edges are embroidered, and may have scallops or other more complicated cutout on those two edges. The right edge is not embroidered because it is covered by the apron. There is a vertical slit opening, and ties to hold it around the waist. A handkerchief and other necessities are carried in this. Here is a relatively simple one. 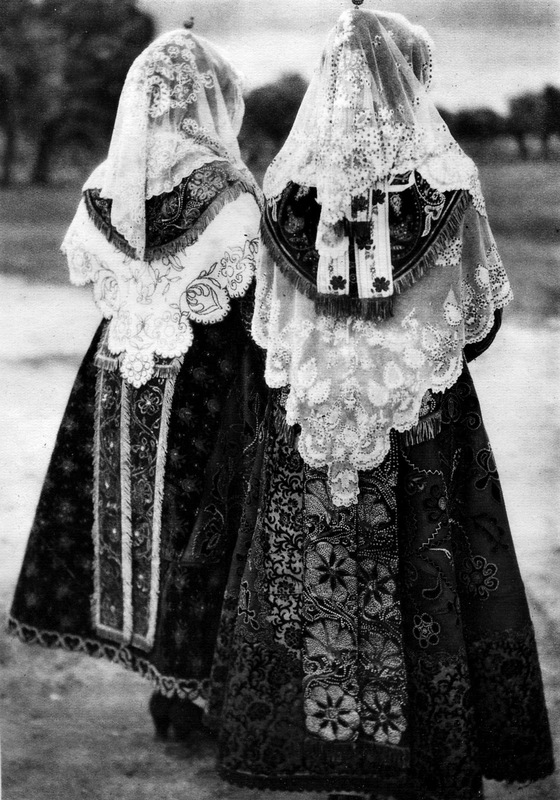 In front one wears the mandil, the apron. This is one narrow panel which hangs to about the knees. It is embroidered as elaborately as the manteo. It may also have elaborate cut out on the edges. Attached to the lower edge is a gathered flounce of brocade, damask, or some other decorative cloth. 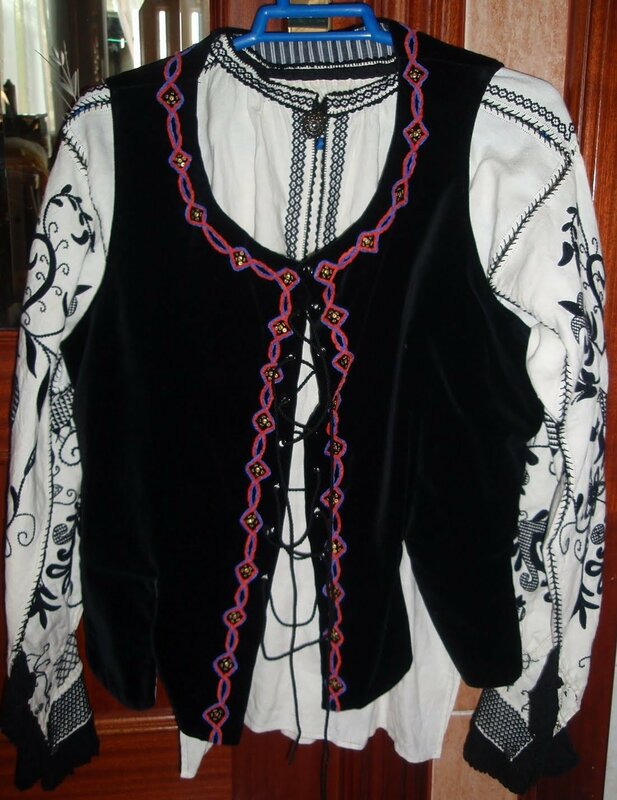 On the torso, over the camisa is worn a bodice with sleeves, the jubona. It laces up the front, and is generally made of black damask. You can see in the various images that it usually has a texture. 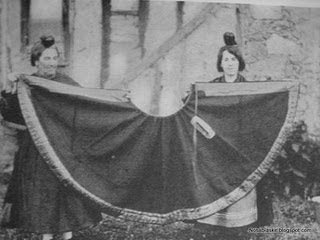 It has five tails which are worn under the saya, or perhaps under the petticoat. There are separate cuffs, called panetas, which fasten about the lower arms. 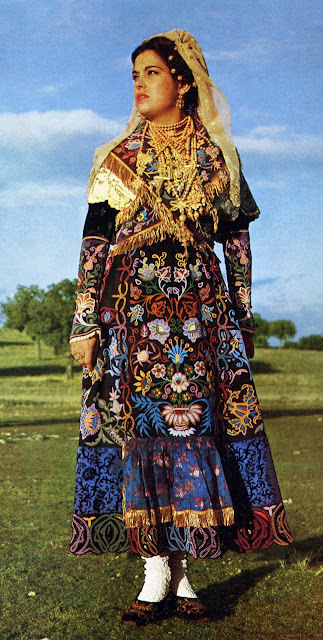 They are embroidered in the same manner as the rest of the costume. 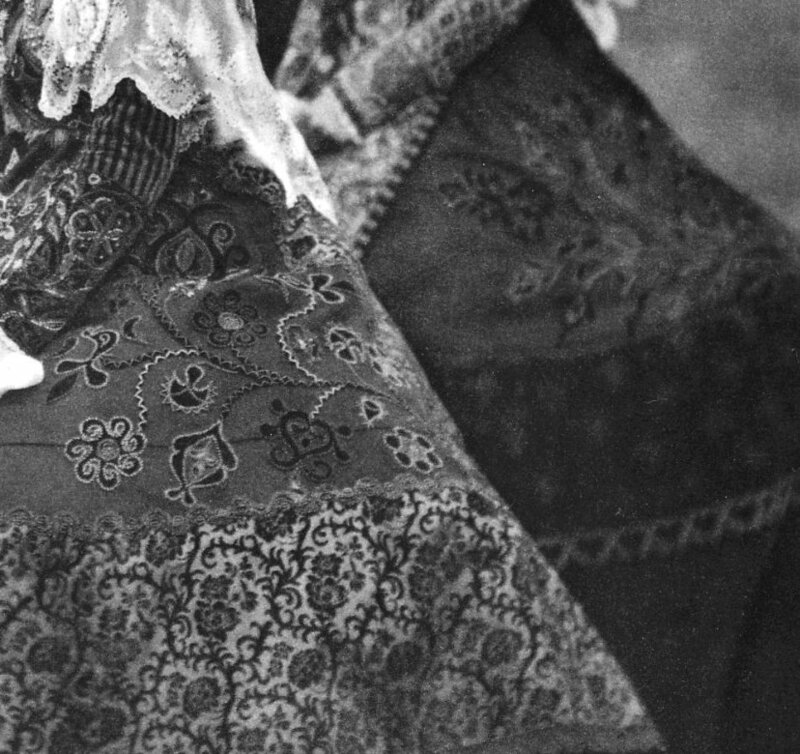 Often there is a frill of lace around the lower and side edges. the side edges often have decorative buttons as well. 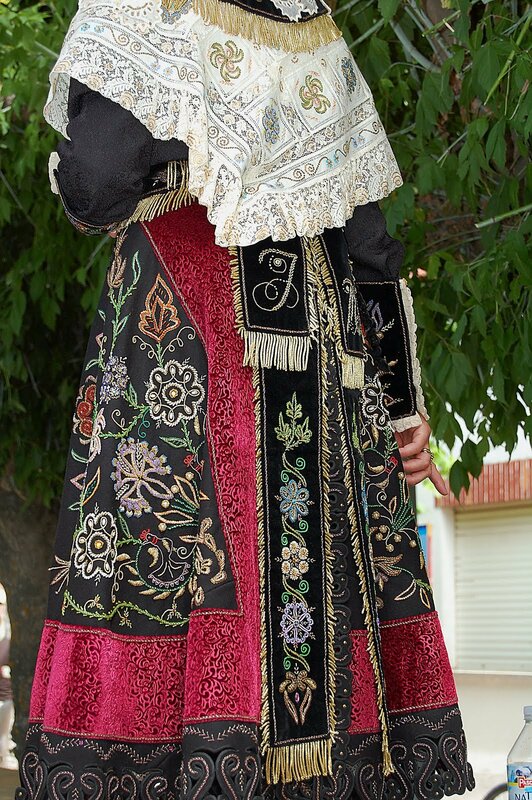 A large shawl, called Panuelo de hombros, is wrapped around the shoulders. This is of white or near white linen, quite fine, and has very fine embroidery all around the edges in a wide band. Over this is worn another shawl, which is called dengue, crucero or rebocillo. 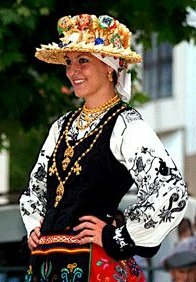 This one is cut in an elongated crescent shape, and wraps over the shoulders, crosses in front, and then ties around the waist. 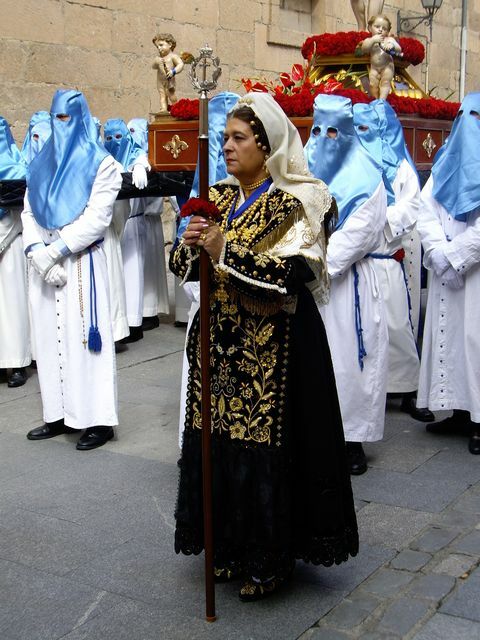 This is very typical of northwest Spain. 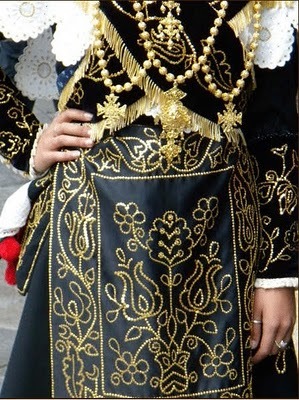 In the charro costume it is made of the same material as the other major parts, generally has gold fringe on the lower edges, and is embroidered to match. The hair is divided into three parts, each of which is braided. 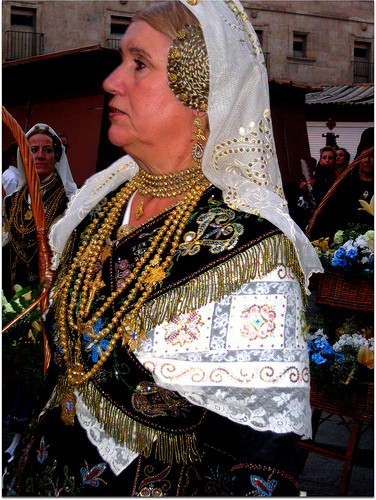 The two side braids are coiled above the ears and are held with gold pins. The back braid is fastened in a loop at the back of the crown and is held with longer pins. 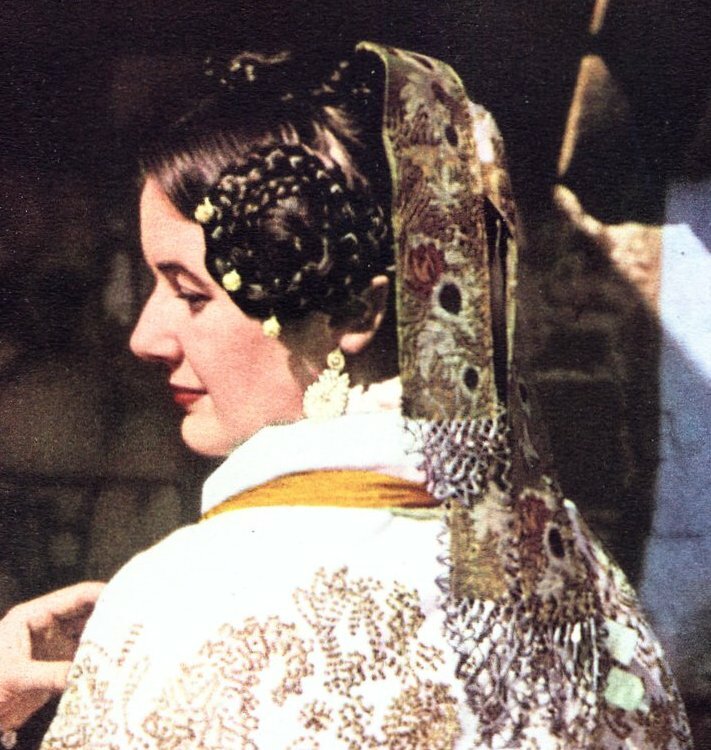 Today these three braids are often artificial, although made of real hair, and pinned on, as many women do not wear their hair that long any more. A smaller bow, called cintas de pelo is pinned to the back braid loop. Over this is pinned a kerchief called the velo, of very fine linen or tulle. This is also embroidered. This first image shows two variants of the costume, the woman on the left wearing only the dengue, and the woman on the right wearing only an elaborate shawl. 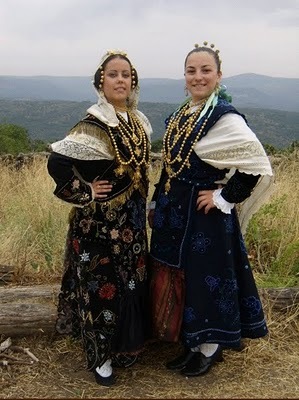 The costume is completed with gold rings, pendant earrings, a multistranded gold choker, and a complicated longer necklace with crossing strands of gold beads, crosses, and religious medallions. One less complex version of the costume has the saya worn as the top skirt, the bodice made without sleeves, and a linen blouse worn underneath with elaborate black embroidery on the sleeves. 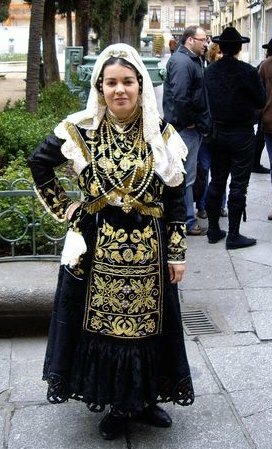 Only in this region would such a costume be considered 'less elaborate'. This is a more 'everyday' version of the costume, and is accompanied by a fancy straw hat. I hope that you have found this interesting and perhaps will be inspired to use some of these embroidery designs on a project of your own. Again i would like to thank all of the people who love this costume enough to put so much material on the web. Here is a video showing all the pieces of the costume. I have to thank the women who made this available. 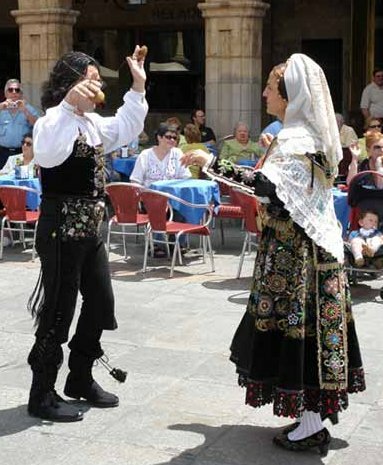 Here is a blog dedicated to all things Salamanca. You may browse this and other postings, and see much more. 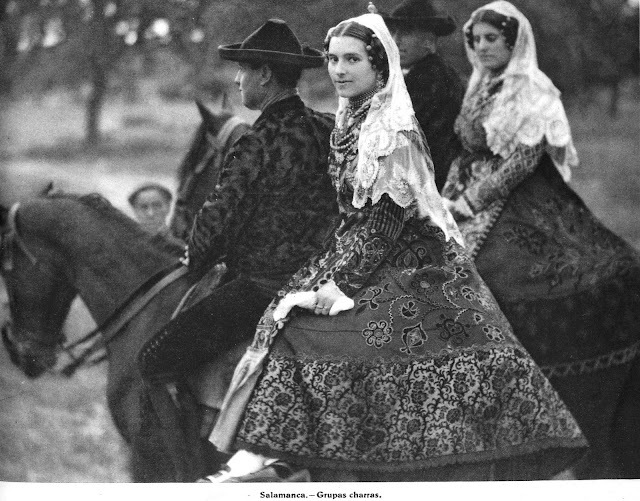 I think that the Mexican tradition of "charro" is rooted in the Spanish traditions of the 16th century. I see many similarities in the mens costumes. Charro is not just confined to Mariachi but also to Mexican ranch life and animal husbantry. 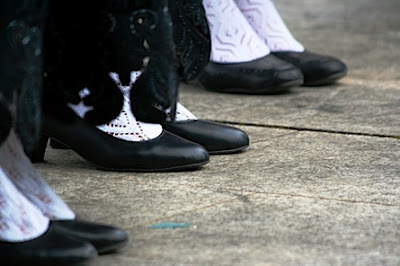 If you do more research on charreadas of Mexico you will find historical connections. I have noticed that many of the costuming details you detailed and explained so well have been utilized in various costuming customs throughout Mexico. Your article was excellent! Thank you so much for posting information about various European countries. I've been drawing a project of my own of some of the traditional women's dresses in Europe and other surrounding countries. Your blog/website has been extremely helpful with both beautiful designs to choose from and information about the culture of these countries.